A typical PTBP dinner (salad not pictured). Happy meatless Monday! Today I have some good news for the carnivores: meat can be one of the cheapest protein sources, if you do it right. Protein is an expensive grocery category, it’s an important part of our diet that we’re not willing to cut back on, yet we eat like kings on about $75/week for a family of four. We are hungry, skinny people, and hummus simply doesn’t cut it for dinner in the Pretend to Be Poor household. But before you quit rice & beans, you’d better learn how to do meat frugally. Of course, people choose meatless for dietary, environmental, or animal-rights reasons. Whatever your protein persuasion, I hope this comparison chart gives you something to chew on. It’s by no means all-inclusive, but I’ve included a variety of popular and relatively thrifty stand-bys. But if you’re trying to rein in the grocery bill and have already started shopping at discount stores, meal planning, shopping with a list, cooking from scratch, and trying my 20 Frugal Food Hacks, your proteins are a great next area to tackle. My calculations reflect the everyday prices at my local ALDI and highlight some of the most cost-effective and popular options. I’ve chosen the least expensive versions of each for comparison. Below I’ll share how we purchase discounted meat & raise our own, plus easy, inexpensive recipes and tips for working with bone-in chicken. And my recipes for homemade beans, and yogurt. I’ve assumed a whole cooked chicken will yield about 75% of weight as meat. I haven’t accounted for the fact that we also put the skin & bones to good use, too, as our grandparents most likely did. 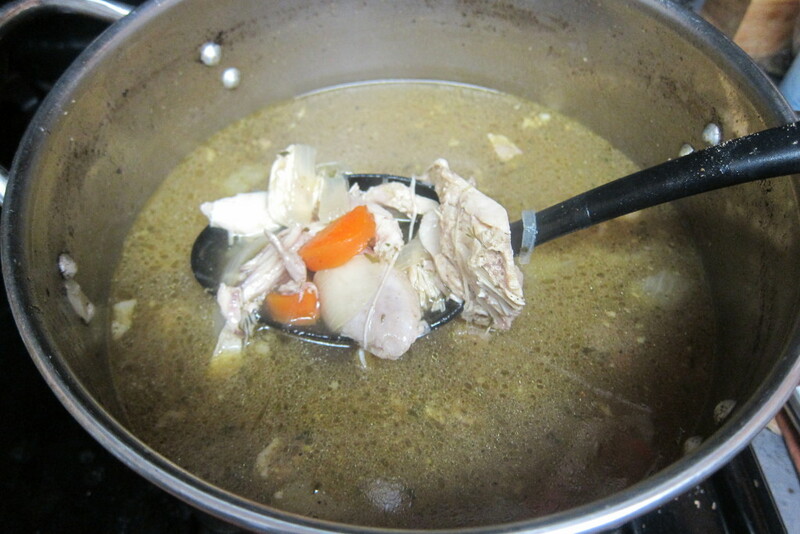 I make homemade chicken broth and we consider chicken skin cooked to crispness a delicacy. Neil calls it “chicken bacon.” Good thing fat is in. Dark meat only yield from a whole cooked chicken. Yes, it costs money to cook and season meat. So the price per serving goes up—but not much if you have go-to thrifty, easy recipes. 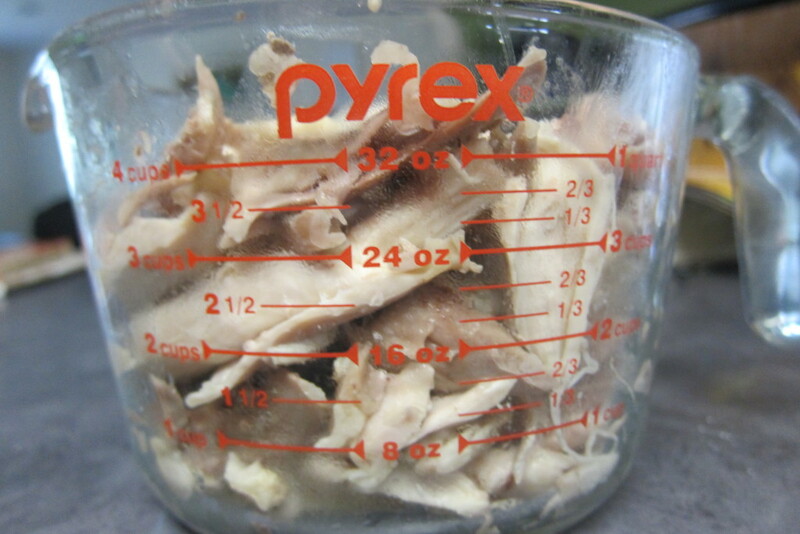 It costs only about 10 to 15 cents to cook a whole chicken in a slow cooker, and around 40 cents to roast in the oven. Considering a 5-lb chicken will yield about fifteen 20-gram servings of protein, cooking itself only adds 1 to 3 cents per serving. Adding inexpensive or homemade seasonings will raise the cost, but not necessarily enough to even compete with canned beans, for example. If you eat only organic meat, many meatless options are indeed cheaper. Buying organic only makes it all the more economical to work with whole birds instead of pricey pieces. It also takes more work to cook raw meat, especially whole chickens, compared with easier options like cheese, yogurt, nuts, or eggs. That’s part of the reasons we mix it up and why I almost always eat peanut butter for lunch. I strive to balance an economy of effort with cost. We also eat meatless dinners several nights a week, for variety, health benefits, and ease of preparation. Why the 20-g protein serving? Obviously protein doesn’t have to be consumed in these portions. We don’t eat peanut butter in 6-TB servings or beans by the whole can. Different items can be paired to form larger servings of protein, such as rice & beans with cheese. Too often we look at the price per item or unit without considering the price per nutrient, such as grams of protein. But isn’t the nutritional value the main reason we need food? Shopping with the lens of price per nutrient can really optimize your grocery budget. 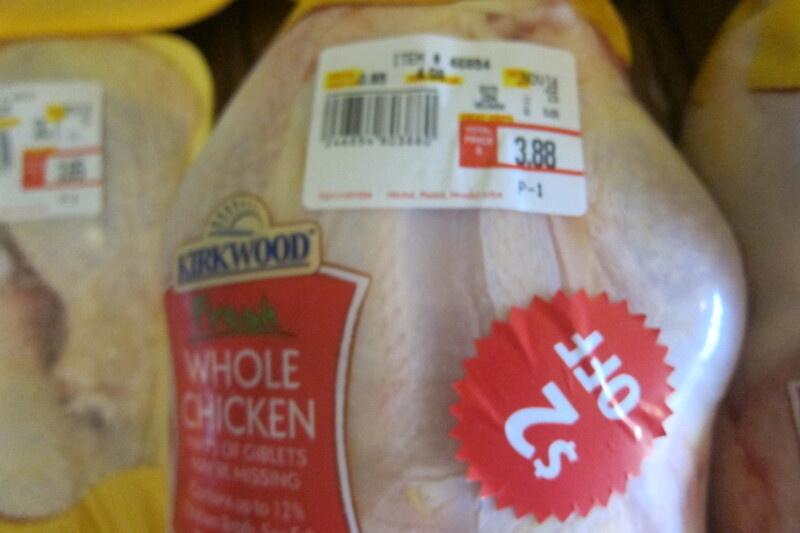 A whole chicken for $1.88. I should add that, though I’ve assumed $1/per pound for bone-in chicken, I rarely pay that much for our chicken or even pork chops. While grocery shopping I’ve always got my eyes peeled for meat marked down for quick sale. This happens surprisingly often at our local ALDI, and when it does, I buy it ALL. Over the summer I purchased over 80 pounds of chicken thighs at just 33 cents per pound, making a 20g protein serving less than 10 cents! You simply cannot beat that price per nutrient. That’s a lot of protein for about $10! So bone-in chicken is actually competitive with ultra-frugal options like pasta and peanut butter, and more efficient (and healthy) as it takes only one small serving versus a triple portion that can run up your fat or carbs too much. We are hungry, naturally on the slim side, and don’t have the time to cook all the wonderful protein-rich dishes that comprise many international vegetarian diets (Indian!). We eat chicken because it’s efficient. Oh yeah, and we raise some of our own which is super thrifty, all-natural, and humane. 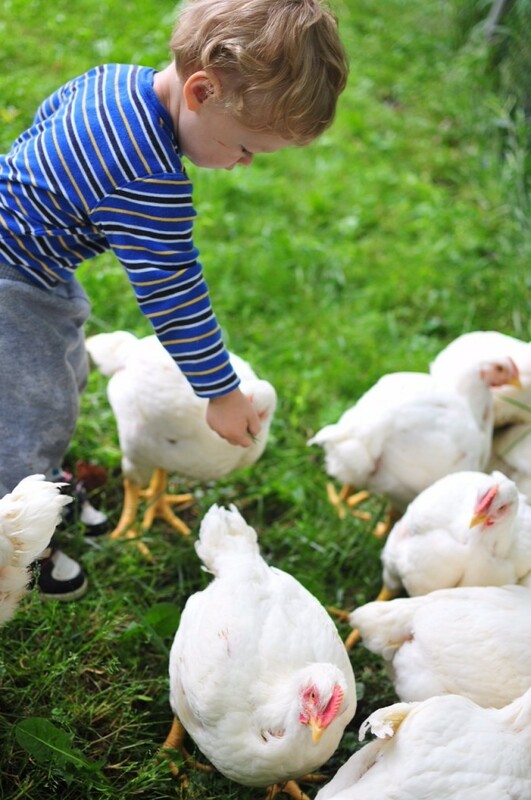 The kids love helping feed the chickens. We don’t eat chicken because it’s our favorite. Frugality accepts that life is not about our preferences, and everything doesn’t have to be our favorite. We have learned to prefer dark meat, even though when we first got married I’d hardly ever eaten bone-in meat and didn’t like it. Frugality also updates its approaches with seasonal costs or market fluctuations. Before beef prices went up, we purchased a quarter cow that our friend raised. We also eat marked-down pork chops when I get them for $1 or less per pound. 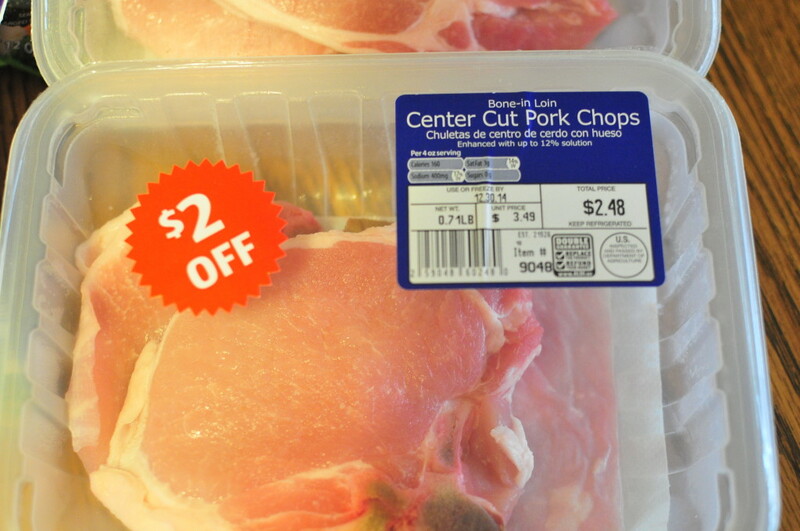 Pork chops for 24 cents a piece. Now for my tips & tricks on working with whole or bone-in chicken. You can learn & get good at it! Within a few tries, I could cut up a whole chicken in less than 10 minutes. Give yourself about 2 days for it to thaw in the fridge or 1 day in cold water in the sink and use a good, sharp knife. Our digital meat thermometer also comes in handy when working with bone-in chicken. My favorite whole chicken recipes: Juicy Roast Chicken or Garam Masala Roast Chicken (get your GM at an Indian grocery). Good uses for chicken cooked in a crockpot: Lime Chicken Soft Tacos, BBQ chicken sandwiches, White Chicken Chili (we use garden peppers, not canned), or any recipe calling for cooked chicken. 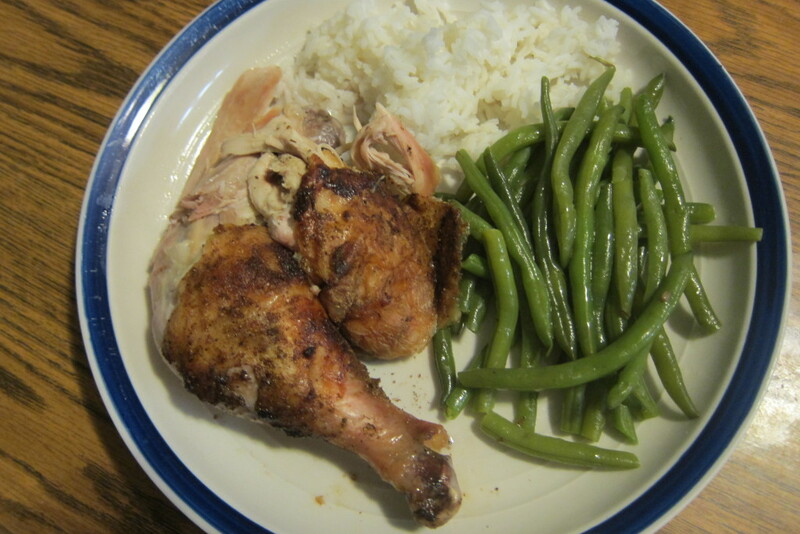 Good chicken pieces recipes: Thai Grilled Chicken Drumsticks, Fall-of-the-bone Roast Chicken Thighs (use whatever fresh or dried herbs you have on hand), or your favorite honey-mustard, BBQ, teriyaki or other sauce. I have lots of good, low-cost meatless main dish recipes but I’ll have to save those for another day. Enjoy your Double Meat Monday! How do you save on proteins? What is your favorite thrifty recipe? Every day is meatless at our house! I don’t think it saves us any money because we tend to spend those grocery dollars elsewhere. We quit eating meat for other reasons. I hope the chart helps with your meatless mains. We’re in the meatless mostly camp over here. When we did buy more meat it was whole chickens prepared how you mentioned. And I always made broth from the bones afterward in the crockpot! I’m gonna check out those Aldi sales though. I usually just skip the meat case entirely! I like your point about how everything doesn’t need to be our favorite! We’ve lived like that so long, I think eventually they become our new favorites. Great point, new habits make new favorites! You might like to google crock pot yogurt. It’s the easiest way to make homemade yogurt that I’ve found. I’ll check it out, thanks! Our old crock pot broke and our new one seems too hot to me, but my husband rigged up a dimmer so I think I could pull of yogurt with that and save some hassle. My wife does crock pot yogurt twice a week. We put it in smoothies for breakfast most mornings. 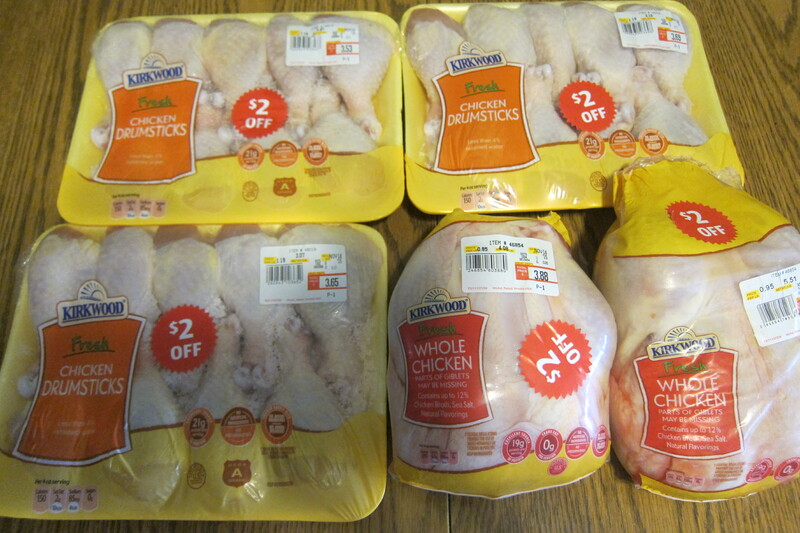 For saving money on protein, we buy our chicken & beef in bulk. We buy our beef locally & our boneless,skinless chicken breasts from Zaycon for about $2 pound. We have purchased beef in bulk from a friend who raised cows. It was worth it to us until the price of beef rose. That’s great you’re getting it locally for such a good price! We’re in the carnivorous camp at our place. Our usual rotation includes stir frys, roasts (or grilling in the summer/fall), and tacos. Once we make a few meals from leftovers, I feel like we have sufficient variety even if we only eat chicken for a few weeks on end. I’ve recently been able to stock up on steaks at less than $1 per pound, and I can usually get a pork picnic for a low price too. We eat more veggies when meat is our main course, so I’m pretty sure its the healthiest choice for us too. That is an awesome steak price! I wish I could find that! I totally agree with you that when done right, animal proteins can be consumed for far less money per gram of protein than plant sources. Great post! Thanks, Cat. I suspected this for a long time but I’m glad I finally ran the numbers. I’m with you on the chicken. So cool that you raise your own! I roast 3 chickens at a time, cut them up, freeze the carcasses and about 20% of the meat to make soup the next week. Besides the initial feast of roast chicken (complete with “chicken bacon”) we love chicken salad sandwiches – great for packing lunches. Our grocery bill is twice the amount of yours, and we thought we were doing well! I think Canadian grocery prices are higher than American prices. I’m pretty sure we eat more than anyone else too. In my experience on vacations, Canadian prices were definitely higher. Three at once is a great idea–more efficient! While I haven’t given up meat entirely like Holly has, I definitely have limited my intake. I don’t think the process by which we raise animals for meat is entirely humane. I’ve seen far too many disturbing videos of the process to really embrace eating more meat. This is a huge part of the reason we enjoy raising our own chickens, and are considering doing more or even raising other animals, too. I also love a lot of vegetarian foods and believe they are super healthy. What a great way to think about protein. Would never have looked at it by price before. Great post! There are definitely many ways to save on protein. Cooking whole chickens sounds like a great idea! Yes–it’s a little more work but we’ve come to prefer bone-in chicken. It’s tastier! You can do it–you’ll get better and faster at working with whole chickens the more you try. We are meat eaters here as well. I usually just crock pot the entire chicken overnight and then separate it into light and dark meat in the morning. My husband also hunts deer and I keep my eye out for marked down meat so we love our deep freeze. I’m pinning this for your yogurt recipe, though. It’s something I’ve been meaning to do on my own for a while but just never have. Thanks for sharing! That is great that your husband hunts! I’m sure you need efficient protein sources to feed your large family.